It's that time of the year again where we round up our favorite apps for kids! We deliberated long and hard before we settled on these 60 apps, and we are so excited to finally reveal them. So without further ado, here are our Best Apps for Kids 2016. A lighthearted app that aims to teach young kids the alphabet, numbers, shapes, and common everyday objects in up to 5 languages. It's simple and easy to use, and is absolutely free of ads. The terrific Daniel Tiger’s Stop & Go Potty has games, music videos, and positive role models that teach toddlers about self-control. It also includes a catchy theme song that helps kids to remember to "stop & go right away" when they feel the urge to go to the bathroom. Sago Mini Robot Party is an open-ended app where kids can build and play with their own robot friends. It features open-ended, silly activities such as smashing cupcakes and breaking piñatas. Great for boys and girls alike. Sago Mini Planes is a fantastic app for young kids who are fascinated by airplanes and flying. It's gorgeous, and loaded with surprises to keep kids giggling away. It's free of ads and in-app purchases. Melody Jams is an open-ended musical app in which kids mix and match characters in a band to play songs. Because the instruments are always in harmony, there isn't really a wrong way to play. The sound quality is excellent in the app, and kids will love the quirky band members. Nampa Holiday will put your kids in a happy mood with holiday-themed activities. It's good-looking and easy to use, plus it has great music and disco dancing. It doesn't require Internet connection, so you can take it with you while traveling. Comomola Fireflies is a sweet, interactive picture book that makes bedtime less scary for young kids and less frustrating for parents. 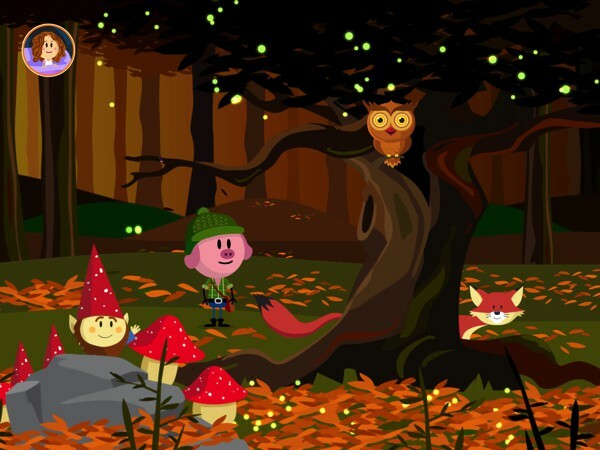 Through fantastical scenes with lights and silhouettes, the app keeps kids calm with soothing routines. Available in English, French, German, and Spanish. Elastic Alphabets helps kids learn the alphabet with 750+ of silly animations. Each letter is introduced alongside their name, sound, and instructions for writing it. The app is simple and easy to use, plus it's free of ads and in-app purchases. Yum-Yum Letters offers a flexible gameplay that can be customized to your child’s ability and preference. You can select the order of letters and font to use, and get progress reports for each user profile. The app also offers 3 unique themes and complementary mini games to reinforce learning and build motivation. Bla Bla Box is a sandbox app in which young kids can independently discover letter sounds, build words, and eventually learn to read. It's not a game, but it's intuitive and interactive. I highly recommend this app if you're looking for an app to help early readers. iPad only. Sound Salad is a simply, kid-friendly sound-object association game that trains concentration, listening skills, and logical thinking. Multiple levels of difficulty allow kids of all ages and abilities to find appropriate challenges. The app is mostly text-free, so young kids can use the app without much difficulty. EduGuru Maths aim to help kids learn basic math skills like counting, basic operations, matching, telling time, and more. It offers an assortment of mini games that cater to a wide range of abilities. It also supports up to six users on one device. The Very Hungry Caterpillar — Creative Play lets kids create beautiful collages using a variety of textures, papers, and paint. The app's simple interface and intuitive tools make it easy to create beautiful collages, the soothing background music gets the creative juices flowing. A must-have for budding artists and fans of Eric Carle. Train Kit is a digital train set that makes it easy to build immersive little worlds on your tablet. Kids can lay down tracks, trees, and buildings, then switch into passenger view to explore the world they just built. Simple and easy to use, the app inspire kids to tinker and get creative. Tiny Great True Stories is a great collection of stories: nicely written, beautifully illustrated, and packed with silly interactions to keep kids engaged. A recording tool allows you to add your own narration and personalize the reading experience. Read4Kids draws on two popular methods for teaching to read in English: the Phonics method and the Whole Language method. It offers 20 lessons, 120 exercises, and more than 150 interactive stories in step-by-step progression, so even first-time learners can follow along easily. The app has a simple but appealing interface that helps kids focus on learning. Trilo Spelling is an educational and adventurous phonics based spelling game for kids grades K-2. Follow the friendly ghost Spooka, the one-eyed mummy Sling and the funny zombie Frank through multiple spelling levels in the enchanting Trilo World while collecting puzzle pieces for hours of fun and learning. In this interactive app, kids learn how to write cursive letters and numbers as they play four exciting games per letter or number. The app offers beautiful illustrations, engaging animations, and clear narration. It supports two popular typefaces in handwriting: D'Nelian and Zaner Bloser, and can save progress and settings for up to three players. Fiete Math makes counting easy for kids to understand. In this gorgeous app, numbers are presented as touchable objects that kids can combine or cut up. This helps them better visualize basic math operations, particularly addition and subtraction to 30. The app has no time limit, so kids can complete the tasks at their own pace. Children of all ages will enjoy choreographing their own dance routines in Toca Dance. This creative app is a lot of fun to play with vibrant graphics, zany characters, and catchy soundtracks. As bonus, a record feature allows children to capture their performances to share with family and friends. If you’re looking for a game that can help your child develop logical thinking and an interest in math, you might want to give Mathie a try. It’s well designed and enjoyable, while at the same time it offers a great exercise in problem solving. With 90 levels that go from simple to complex, this app is sure to keep your kids busy for a while. iPad only. Toca Hair Salon 3 is the newest update to Toca Boca's bestselling app, and it's better than ever. It packs diverse characters, the ability to grow beards, new hairstyling tools, and lots of gender-neutral accessories. It's kid-friendly, yet very satisfying for the whole family to play. Grandma's Great Gourd combines a charming Bengali folktale, minis game, and short videos on South Asian culture. It's a very well-rounded app with great production value and excellent educational benefits. The story itself presents a positive message about staying level-headed in the face of danger and resourcefulness. Space Math Hero is a great math drill app that offers interactive exercises for ages 5+. It covers everything from addition and subtraction to multiplication and division. The app supports unlimited user profiles, which means it’s suitable for classrooms. Weather by Tinybop is a delightful app that unravels the science behind rain and shine with gorgeous and responsive models. The interface is text-free by default, but interactive labels can be turned on to show information in 40 different languages. It's a fantastic resource to have at home or in the classroom. In Zcooly Time Ranch, kids learn to tell time by helping farmer Gunnart feed his strange and exotic animals at the correct time. The app is beautifully illustrated, with 3D graphics and 9 different animal families that can be collected. All text is spoken dialog, so kids who are not yet able to read can also play. Patchmania KIDS is a vibrant game in which kids draw paths for adorable bunnies so they can collect all the carrots in the field. It features 625 original puzzles suitable for a wide range of ages, grouped by difficulty across several themes. The app has ads and no in-app purchases, and includes hints to help struggling players. Easy Music teaches kids to recognize notes, pitch, rhythm, and melody with game-like activities. It uses an intuitive, non-theory approach that is accessible by kids of all levels. It's also available for Apple TV. Toca TV is an interactive video platform designed for kids ages 5 to 9. It offers thousands of original and curated videos from around the web, across various topics. Each video is handpicked and prescreened to make sure it's appropriate for kids, and there is never any third-party advertising or sponsored content. Fox Tales is an interactive book-app with the features of an adventure game. It's well written and beautifully illustrated, with 45 pages of beautiful, hand-drawn artwork. Narration and text highlighting are available for developing readers, as well as support for five languages: English, Polish, Russian, Spanish, and Chinese. Amos the Astronaut is an interactive adventure with an interesting plot and engaging puzzles. Designed for young kids, it has audible speech bubbles and step-by-step guides. It has no ads and no in-app purchases. In Pettson's Inventions 3, kids use logic and problem solving skills to complete imaginative inventions like the egg-painting machine or the puppet theater for hens. The simple interface combined with engaging puzzles make the game appealing for all ages. In this delightful game, kids save helpless critters by jumping from number to number in sequence. It's a playful way to practice skip counting, and the setup is engaging. The adaptive game engine ensures that each player will find a suitable challenge for their skill level, but grown-ups can also customize the gameplay manually. Milie Moreorless helps kids develop number sense by helping the titular character, Millie, solve magnitude-comparison problems. The gameplay is straightforward but appealing, and has a moderate amount of challenges. It's designed for children with Down’s Syndrome, but easily accessible by everyone. In My Spacecraft, kids explore interactive models to learn about outer space. The topics are organized in a way that is easy to understand, and are accompanied by illustrations and voiceover. There are no rules or levels in this app, so kids can learn at their own pace. Veggie Bottoms Kitchen invites kids and parents to cook real vegetarian dishes together and have fun in the process. It has an excellent selection of recipes that cater to various dietary restrictions, plus they are fairly easy to make. If you are having trouble getting your kids to eat their fruits and veggies, you might want to give Veggie Bottoms Kitchen a try. Camping with Grandpa teaches kids about wildlife, trail safety, and eco-awareness with mini games and real-life videos. It's full of encouragement and funny surprises to keep kids motivated. It's also easy to use and safe for kids. Whether your child is a budding musician or a fan of music in general, they will love Mussila. It has challenges and activities to help kids develop their knowledge of music and create their own tunes. Good production value coupled with easy-to-use interface makes the app a joy to play. Scribble Press lets kids hone their storytelling skills by creating their own books from scratch or pre-made templates. The app is well-made and easy to use, and offers excellent customization options that facilitate each child’s creativity and imagination. Great for use at home or in the classroom. Busy Water is a critical thinking puzzle game where you connect pipes to help a fish get back to his tank. The concept is fairly simple to grasp, but it makes for an addictive playing experience. In trying to find a way to rescue the goldfish, kids are challenged to think spatially and solve problems creatively. Manuel's Socks tells the story of an okapi who is initially embarrassed of his unique features, but eventually learns to love them. It deals with the acceptance of differences and reinforces self-esteem in a playful way. Me by Tinybop gives kids a safe space to tell their stories, express their feelings, and document the world around them. It prompts them with thoughtful questions to create a dynamic snapshot about their lives. The app provides easy-to-use, creative tools so kids can express themselves in many ways. Tsuro is an elegant board game that will appeal to all ages. This iOS port preserves the tactile experience of playing the cardboard version, while adding support for online multiplayer and original challenges. If you love strategic games that are pleasant to play, Tsuro is a must-have. Infinite Arcade lets kids expand their creativity and problem solving skills by designing, creating, and playing their own video games. It has no rules or scores, so kids can build things as simple or as complex as they want. Curiosity is highly encouraged and even rewarded with products that they can play. A Breathtaking Picnic is an interactive picture book that teaches kids basic first aid skills in case of cardiac arrest and choking. Through the story, they learn the few simple steps that they can do in emergency situations. A must-have for every family. Skyscrapers by Tinybop lets kids discover how tall buildings are built and maintained. It's highly interactive: kids can tap or drag to build their own buildings or learn more about its inner workings. Older kids can turn on labels to read the names of various building parts. A detailed handbook assists grown-ups in getting the most out of the app. Namoo takes kids on an immersive tour through the life of plants. It's has nine chapters that explain the inner workings of trees and flowers, including cell structure and photosynthesis. This beautifully illustrated app goes beyond the typical textbook, and allows curious kids to learn deeply through exploration. The Foolish King is an interactive app that introduces kids to chess. It's split into several parts: a gorgeous storybook about a fictionalized history of chess, chess basics and tutorials, and an actual chess game for up to two players. The clever presentation engages kids and even adults to learn and play. App is free to download with a one-time in-app purchase to unlock the full content. In Brain Aliens: Earth Invasion, kids play mini games to charge a cannon and blast its powerful laser at alien invaders. The games are designed to train the brain at subjects like memory, logic, spelling, and math. Each round of game lasts just a few minutes, thus the app is perfect for anyone looking to play in short sessions throughout the day. The Creatures from the Past app provides an extensive look into 60 extinct animals from millions of years ago. With a simple interface, gorgeous 3D models, and 360-degree view for each animal, this app will engage kids to learn for hours on end. Smashing Grammar is an exciting app that helps kids refresh their grammar skills and learn thousands of new words. The games can be played endlessly with increasing levels of difficulty, thus providing challenges for all skill levels. A great app to have at home or in the classroom. ChemCaper is a full-fledged, fantasy role-playing game designed to get children excited to learn chemistry. As players battle monsters, complete quests, and level up, they also explore a beautiful world built from the ground up based off chemistry concepts. This is a polished attempt at creating an educational game that even grown-ups will love, and as such is highly recommended if you’re looking for an enjoyable supplement to traditional lessons.